Hundreds of people rely on a known water fountain at work, school, or as they make their way outside. But are they really safe? What Is a Drinking Fountain? Where Does Water from Drinking Fountains Come from? Who Should or Shouldn’t Be Drinking from a Water Fountain? What Kind of Diseases Are Present Through Public Water Fountains? When Should You Drink from a Public Water Fountain? Why Are Water Fountains Unsanitary? How Can I Drink Safely from a Public Water Fountain? 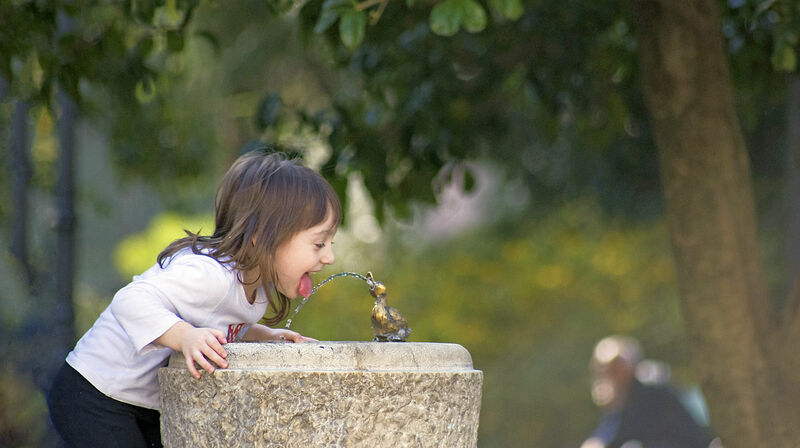 Drinking from a Public Water Fountain: Safe or Unsafe? A drinking fountain or a water fountain is by definition a public place that provides drinking water for the general public. You can usually find them in easily accessible places in high-traffic areas such as airports, offices, schools, shopping malls, and even bustling city centers. The water public fountains provide is usually just the same as tap water. Unless a drinking fountain is explicitly known as part of a school or office’s water filtration system, for example, the water it spouts will most likely be tap water. In many western countries, tap water can be safe to drink — you can even see locals filling up their water bottles in bathroom sinks, in full confidence at the cleanliness of their water. But not all tap water is one and the same. To be safe, always ask a local if their tap water is safe to drink right out of the tap. Otherwise, you would be better off purchasing some purified water in a store or filter some water yourself at home. If you’re a person who is completely healthy and possess a strong immune system, you should be clear to drink from public water fountains. Besides the risk of the water carrying contaminants, the water fountain itself (basin, handle, rim, or tap) may be in constant exposure to the air or physical contaminants. Babies below a year old, as well as young children, should not be allowed to drink from public water fountains. The same goes for pregnant and lactating women. If you decide to drink from a public fountain, be sure to wash and disinfect your hands immediately after using them to avoid picking up bacteria. Better yet, bring your own filtered water from home. Water-borne diseases are prominent in unfiltered tap water like the kind available in public water fountains. Diseases like E. coli, influenza, Norovirus, giardia, Shigella, and Legionella are just a few among several water-borne diseases you can pick up from a public water fountain. In 2011-2013 alone there were 32 outbreaks related to water-borne diseases. Metal contamination is also another risk due to old and neglected pipes that wear off and shed harmful minerals like lead into the drinking water. What Is Norovirus? This is a very contagious virus that commonly causes gastroenteritis in humans. Commonly known as the stomach flu, it causes vomiting, diarrhea, and stomach cramps in its afflicted host. What Is Giardia? A microscopic parasite that causes Giardiasis, an infection of the small intestines. It is usually found in unsanitary places and contaminated water. What Is Shigella? A bacteria that causes shigellosis, which can be transmitted through eating contaminated foods, or by swimming or drinking contaminated water. Some strains of these bacteria also cause dysentery. What Is Legionella? This is a kind of bacteria that causes Legionnaire’s disease, which is a severe and sometimes even lethal, kind of pneumonia. It is found in potable and non-potable water and freshwater sources such as streams and lakes. Sometimes, you just need water and have none available. You may have your own safe drinking water but bottles aren’t bottomless or maybe you have thrown away your water as you check into a flight. Check if a water fountain looks clean and constantly cared for. A derelict water fountain may be in constant disrepair, or may not go under enough maintenance to keep its stream of water pure or safe. Also, don’t rely solely on public water fountains as your only source of hydration. If at an airport, drink only enough to keep yourself hydrated. While not all water fountains are dangerous or pose a health risk, their notoriety isn’t entirely coincidental. Due to the rise of home water filtrations, compact and convenient water storage for thirsty people on the go, as well as a flourishing industry selling packaged drinks, public drinking fountains have fallen victim to disrepair and neglect. Though public water fountains were around even in ancient cities, and have been indicative of a city’s prosperity while also providing anyone with a quick, refreshing drink of water, it hasn’t kept up very well with the times. Let the water run for a few seconds before you drink from it. This allows for enough time to wash away any bacteria left at the mouth of the dispenser. Avoid your mouth coming into contact with any of the water fountain’s surfaces. Keep from touching the base part of the fountain. Make as little physical contact as possible. Thoroughly wash your hands afterward to remove any bacteria that may have snuck onto your hands. The idea of water fountains seems novel and convenient, and there’s nothing more tempting than to take a sip especially when there are no other hydrating drinks in sight. But the risks of picking up a disease far outweigh the temporary relief you can get from drinking at a public water fountain, so it’s best to look for drinkable water elsewhere. Have you ever had a bad experience with drinking at a public water fountain? Share your experiences with us in the comments section below.